But now I love the idea of serving a chocolate cake with chocolate icing because your guests will never expect it! This lovely fall-inspired cake is actually a three-tiered chocolate torte covered with chocolate ganache. 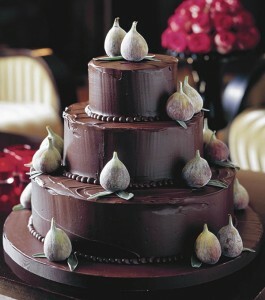 And the only embellishment – other than the lovely piping around the tiers – are fresh figs. This cake is elegant and out-of-the-ordinary, which is perfect for today’s modern couple. You can find this chocolate wedding cake here.